You can use the “Save As” button that appears when viewing an individual response to save a customised export of the response. In the Survey, Click the “Results” tab. Choose your options, then click one of the buttons at the bottom of the dialogue box. Options that are ticked will be included in the export. Options that are unticked will not be. Include or exclude additional comments from respondents (where the option was added to a question). Include or exclude details of the survey page numbering. Include or exclude question numbers. Note: These may not match the numbers shown to users if descriptive text elements or skip logic is used. Include or exclude multiple choice answers that were marked as headings using the <h> tag. Include or exclude details of the overall survey score for that response. Include or exclude details of the page score for that response. Include or exclude details of questions that the respondent did not answer, either because it was not mandatory, or skipped past because of Skip Logic. Include or exclude a box with details about the respondent such as contact list information and any information passed in via custom variables. 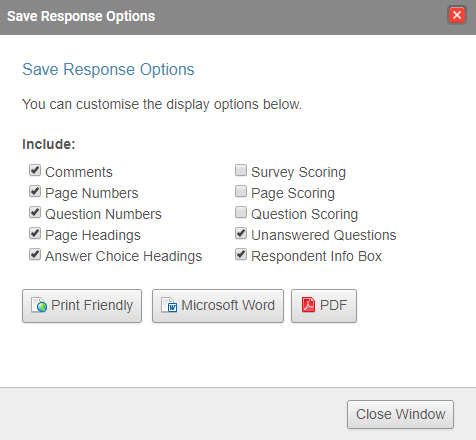 Choose to export the response as a word doc, PDF, or to display a print-friendly HTML page.